The job title of “project manager” is pretty common these days. 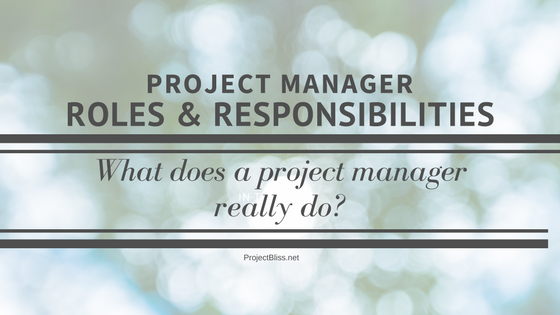 But project manager roles and responsibilities can be pretty vague if you’re not already familiar with them. I know this firsthand, just by watching reactions when I tell someone I’m a project manager. When my mom asked about my job and I said I was a project manager, she furrowed her brow and asked what that meant. I explained that I work with my project team to create and execute solutions to solve a customer’s problem. I’ve tried to explain it more clearly. I think she still has no idea what I do. I imagine many who hear the term “project manager” don’t understand what it entails. I, however, feel like I make magic happen. Someone has an idea, and I work with a team to make it real. Someone has a problem, and I collaborate with a team to solve it. Project managers can play a part in changing the world by executing projects. But I think my mom imagines that I just sit at a desk all day and work on a computer doing computer stuff. So basically she’s the person responsible for managing the project, and the person responsible for the project’s success. But there’s a lot that goes into achieving those objectives. I talk constantly on this site about how fantastic project management is. But for those new to the idea of project management as a career, I want to list out very clearly some of the roles and responsibilities of a project manager. As you look through the list, notice how many different skill sets are used. I recently wrote a post on 10 Essential Qualities of Great Project Managers. As you read through the list of project manager roles and responsibilities, you’ll see how these skills come into play. You’ll see there’s some overlap across items in this list. But each plays such a key part in the Project Manager roles and responsibilities that I wanted to give item each a separate focus. When you start your project, you need to have a good idea of what will be included in the work you do. It’s also just as important to be clear on what your team is NOT responsible for. Clearly defining the scope will help your team focus and ensure that you and the customer have the same understanding of what will be included in the solution. Read about how to create a scope management plan. Use a project scope statement template to get agreement among all parties. 2. Gathering the project requirements. You’re responsible for ensuring that project requirement information is gathered and documented. You’ll work with your team, the customer, and others involved to gather all information necessary to have a good understanding of the solution and what’s needed. Business requirements explain how the solution will address a specific business need. Functional requirements explain what your software must do and the steps to carry out that activity. There are other types of requirements and various methods for gathering them. To find out more detail about the requirements process, you can read my post on Software Project Requirements 101: What You Need to Know To Get You Started. 3. Identifying activities, dependencies, sequencing, and time estimates. You’ll work closely with the team and those who’ll be doing the work. You can’t possibly know all the necessary information, and you’ll need to turn to your team for their knowledge and expertise. If you’re using a traditional waterfall methodology, you’ll likely create a baselined schedule with target due dates for the entire implementation. If you’re using a more agile or iterative approach, you’ll still work with the team to identify what’s needed, dependencies, etc. The needs will vary depending on your project. These activities could include user training, and putting help desk support in place. If you’re replacing an old legacy system, you’ll need to plan for how you’ll handle the existing data. Think through all the activities involved in a successful delivery. 4. Identifying resources needed for the project. Resources could mean additional team members – though you’ll want to keep in mind that these are real people with real lives. It also includes items you may need to purchase, such as software, hardware, equipment, etc. As you identify all the resources you need for your project, you’ll be able to create the project budget. Work with the guidance of your organization in putting this together. It’s carried out differently depending on your organization’s guidelines. This post provides instructions and a template for creating a project budget. 6. Identify deliverables and milestones. Determine what deliverables you’re team will have along the course of the project. Establish milestones along the way. You can use these to track progress and reporting. 7. Coordinating resources, team members, and vendors. To pull together the project plan, and execute on that plan, you’ll need to coordinate people and resources continually along the way. Make sure team members know about potential problems or unplanned interdependencies. Confirm that resources are allocated and available as needed. 8. Monitoring and Controlling the project plan. You’ll need to continually make sure the project is on-track and deliverables are met. Monitor project progress by frequently communicating with the team and those doing the work. Watch for unexpected changes. Take action to make corrections and adjustments when unexpected situations arise. Use your problem-solving abilities to keep the project moving forward. Recognize when problems occur – or even when you see the possibility of potential problems. Gather the necessary information, bring people together to problem-solve, and address issues. 9. Identifying the appropriate metrics. If you want to know what success looks like for your project, you need to define what that means. It helps if you can identify metrics to use as a measure. Your project goals may be to reduce costs, reduce processing times, or increase revenues for a customer. Establish the best metrics to measure against, so you’ll know if your project has met the intended business goals. Simply creating a plan doesn’t guarantee the quality. You want to deliver a quality solution to your customer. This means things like providing software that works correctly with no bugs. Giving users manuals that are clear and correct. It’s better to build quality in – preventing rework – than to correct problems after-the-fact. Completing rework due to defects and poor quality increases your project costs. Plan quality in and ensure that everyone understands what that means. Use quality management tools and processes throughout the project. Your project may require external resources, such as purchases or work from vendors external to your organization. If so, you’ll likely need to coordinate them. Make sure that vendors know when to deliver and install items you’ve purchased. If you’re using consultants for any of your project work, managing contracts and vendor deliverables may be a part of your role. 12. Serving as the single point of contact for the project. There are many components, stakeholders, and potentially impacted areas involved in projects. It’s important for one person to have a grasp of the big picture and be the main point of contact for all involved. The project manager serves as that central point of contact who orchestrates all the work involved. If anyone needs information about the project or needs to share information about the project, there needs to be one person everyone can point to or know to contact. This prevents information from being missed by some and reduces risk. As the project manager, you may report to stakeholders, governance bodies, and anyone else who needs project information. These reports could be regularly scheduled or ad hoc, and could include data on status, risk, or any of the identified project metrics. During planning, you’ll work with the project team to identify potential project risks (check out How to Create a Project Management Risk Matrix). As you move forward through execution, you’ll manage those risks by continually checking with the team and tracking against the Risk Matrix (How to Manage Project Risk While Running Your Project). You’ll also need to know when and how to escalate project risks as needed (7 Strategies to Follow When Escalating Project Risk). The customer must be ready to accept and adopt the solution. If the customer doesn’t adopt the solution then the expected benefits can’t be realized. Where appropriate, you’ll need to communicat and socialize the upcoming changes, get customer input and feedback, and prepare users to ease the transition. This could involve activities such as training and webinars, among others. The project manager sets performance expectations for the team. She ensures that everyone knows what is expected, and sets an example for the team. She provides direction and motivates the team to execute on the plan and deliver a quality solution to the customer. Much of this involves removing roadblocks, inspiring the team, solving problems, but doing it with integrity and respect for the team. Foster collaboration and supportive working relationships across the team. Give credit to the team for successes and celebrate wins. Work closely with the customer and stakeholders. Have a clear understanding of the business need. Manage expectations when there are changes. Maintain communications with all involved in the project. Communication is a critical activity across many of the items in this list, but it merits mentioning on its own. Communicate with vendors, team members, customer, and other stakeholders. 19. Having and maintaining a strategic, high-level view of the project in the context of the organization. Be aware of interdependencies or impacts from other projects and initiatives. Understand how market changes could impact or influence the project. This could be seen as more of a Portfolio Manager or Project Management Office (PMO) Manager role. However, many organizations don’t have that role. Additionally, it will serve you well to have this greater understanding as you grow in your maturity in your career. There could be various acceptance points throughout the project depending on the approach the team uses. You may need customer sign-off on multiple deliverables, or customer approval for move-to-production, or final customer sign-off for final delivery. Whatever user acceptance is for your project, make sure everyone has the same understanding of those customer acceptance points. Be clear on the criteria for acceptance also. This avoids unpleasant surprises just when you’re ready to celebrate. These activities may include budget reconciliation, conducting a “lessons learned” session, ensuring that support teams are taking over where necessary (though this is planned for and started much earlier). Much of this is administrative and required for final project completion. 22. Taking care of administrative project work. There are going to be things that don’t fit neatly into any of the items in this list that need to be done as part of the project. Some examples are making sure there’s a document repository for all project files and making sure that the latest versions are available to all who need them. Staying on top of these activities will make life easier for you and the team. You’ll note that this list of project manager roles and responsibilities provides enough diversity that the job doesn’t get boring. Also, it allows the chance to grow in the career. As a new project manager, you might take on smaller, less risky projects. As you gain experience, you can take on projects that are larger and more complex. If you have a desire to grow in your organization, you may find ways that aren’t listed explicitly in this list of project manager roles and responsibilities. For example, if you want to give presentations to larger groups or executives, you may be able to find opportunities by working with your boss. Hopefully, this gives some clarity to the diverse activities involved in the project manager roles and responsibilities. If you have questions about anything list, let me know in the comments, or just reach out using the “contact me” form. Excellent article, as always. This would be a great resource for HR folks and mid-career counselors and coaches. And if our moms still don’t understand, at least they’re proud of us and whatever-it-is we do. Dave – so you can relate! I’m sure many others can too! Thanks for the compliment on the article – I appreciate it. I hope it gives clarity to those who are curious about what project managers do (including maybe our moms).